St James the Less from Rectory Road in more rural days. The gate led into Webster`s Meadow. 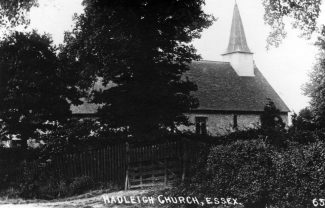 It is highly likely that some Hadleigh villagers in the period 1825 to 1853 never once saw the Rev. John Mavor, the Rector of St James the Less. He probably visited Hadleigh to be inducted but whether he visited again, even for a few days, we do not know. He was certainly absent for the vast majority of his rectorship. Twenty eight years was a long time for a village church to go without a guiding hand. The result of the Rector`s absence was a partially wrecked church, an almost totally ruined rectory and many associated problems including difficulties for the newly established church school. The man concerned (or perhaps unconcerned?) was the Rev. John Mavor, Curate of Forest Hill, Oxfordshire, and a Fellow of Lincoln College, Oxford. In 1825 he was presented to the Rectory of Hadleigh by Lincoln College, which owned the advowson, the right to present Rectors to the Hadleigh parish church. John was the son of a very distinguished churchman, Dr. William Mavor, whose “Spelling Book” was very popular, especially with preparatory schools. By 1838 this remarkable book, first published in 1800, had reached its 438th edition. Dr Mavor was a very significant figure in Woodstock having been Rector, Alderman and Mayor of that place. At the age of 15, John won first prize in a competition held annually by The Preceptor or Juvenile Library a magazine for young people. The task was to write an English composition. What exactly he wrote is not known but he was awarded a planetarium and a tellurum, together worth 3 guineas. Entering Wadham College at 16 in 1802 he gained a BA in 1806, an MA in 1808 and progressed to a Bachelor of Divinity in 1816. He was also a Fellow of Lincoln College from 1806 to 1826. On paper then, his family background and academic progress pointed to a most promising career. The problem lay with the weaknesses of his character. Betting among the fellows of Lincoln seems to have been commonplace and on all manner of trivial subjects. We know that Mavor indulged in these activities and both won and lost bets although the winnings were mainly bottles of wine. He was also the subject of other people`s bets, one instance being whether he would sell his pony for 20 guineas before Christmas. It could have been that when he later fell into considerable debt, betting may have added to his disappearing funds. The Rector of the College was extremely annoyed when Mavor refused the Greek lectureship at the college. He was “an indifferent scholar” and “so much ignorance and irreverence in a fellow I never before encountered” (2) railed the Rector which makes one wonder why he offered the lectureship to Mavor in the first place. Clearly college politics were complex and according to Rev. Clark were made more so by Mavor`s violent personality. Despite the fact that the college supplied £400 towards the improvement of his new residence and he was taking in two stipends including £350 per annum from Hadleigh his tastes proved rather more extravagant than his income would allow. He appears to have overspent to such a degree that he had to rely on his father to extract him from financial embarrassments. Increasing insolvency came to a head in 1832 when his house in Forest Hill had to be sold. The newspaper advertisement for the auction of the property and his effects is very revealing as it shows that he lived in style. He was unmarried and had only himself to support but he was a hunting, shooting and fishing man, apparently with plenty of companions. For a period he was entrusted with shooting rights to Forest Hill Manor on condition that he supplied to the college eight brace of birds during the season. His property included two pointers, two spaniels, two horses and “a capital single shot-gun, by Sykes”. His furnishings, including beds, bedding, mahogany furniture and Turkish carpets were all of very good quality. He had also possessed “a modern Dennet gig” and “an excellent library of books”. An eight month spell in debtors`prison in 1834 made little difference to his position. At his father`s death in 1838 the will was generous to John`s brothers and sisters but William had clearly had enough of his financially wayward son “ for whose advancement in life I long sacrificed my own personal comforts and independence and who has already cost me so much. ” He had first helped John by providing him with £150 and then “ upwards of £200 ”. (5) William left him only some copyhold lands on the proviso that the £150 was repayed. It would appear that John failed in this regard. Without his viewpoint being visible through surviving letters or a diary it is quite difficult to see into the mind of John Mavor although we catch a few glimpses from one surviving letter and the correspondence in the 1840s between the Archdeacon of Essex and the Rev. Robert Eden, the diocesan inspector. An unamed parishioner wrote to Mavor complaining about the use of the chancel as a schoolroom which was causing “ both desecration and delapidation of the sacred edifice.”(6) Eden inspected the school and immediately recommended to the archdeacon that the schoolmaster be sacked, that he be replaced by a woman and also that the school be opened every day of the week. He does not record exactly what he saw. In his words there is a distinct whiff of self pity and an indifference to responsibility for what was happening in the parish. At an ecclesiastical court in 1848 Mavor was investigated for holding two benefices and taking two stipends. The five judges of the Arches Court found against him and the removal of the Forest Hill curacy was confirmed. Of course, all this activity took place whilst he languished in prison. He was not friendless in prison. The fellows sent him a new suit of clothes every year and he received visits from some of them and other friends but he was not always grateful. One year the fellows thinking that “it was shameful for clerical garb to be worn in a common gaol”(9) proceeded to give him a suit of grey material although in a clerical cut but this Mavor angrily rejected. Despite his less than pleasant nature and his weakness when it came to money and its management, he was clearly a man of some scruples. This is revealed in the report of his death in gaol on Sunday 26th June 1853. He had been ill for some time but refused to see the medical attendant and often refused food for two or three days at a time. A sad postcript to John`s death was also noted by the newspaper. If he had lived just another four months, the sequestration of the Rectorship of St James the Less, begun about ten years earlier to pay off his debts, would have been cleared and his stipend of £350 per annum would have been restored to him. Unfortunately the Rev. Mavor`s debts and absence had substantial reverberations in Hadleigh. It had created considerable worry in the 1820s for Mrs Lovibond and her school for the poor of the village. It had also resulted in the deterioration of church property. During Mavor`s absence the duties of the Rector, including services, had been conducted rather spasmodically by “the meanest clerics”. It also appears that the churchwardens had not been particularly conscientious. The Rectory so long out of use and largely made of wood fell into ruins, and much of the building materials including the small amount of stone was surreptitiously carried off by villagers. The new Rector, whoever he turned out to be, clearly had a huge task ahead of him to restore the spiritual well being of the parish and to rebuild the fabric of the church and rectory. At this juncture, luckily for Hadleigh, it was blessed with the arrival of the Rev Thomas Espin. An excellent piece of research about John Mavor. I have been transcribing the births, marriages and deaths for Hadleigh from the parish records and have only discovered one entry by John Mavor as rector. It was a burial on 2 November 1835 for William Gyant, aged 20 years. Rev. Mavor added the comment ‘an idiot’ to the entry!